Are you building a startup. Here are 8 business model template tools to help you plan out your offering, product or service, before you get started. 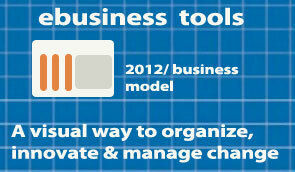 A tool to create and share business models. This is the one we use. It works well, it’s SAAS, and best of all its Free! Offer a paid tool kit, consulting and workshops. Model themselves as a kind of eye on innovation and startups around the globe. Offers a Business Model Canvas, template to help you to describe, design, invent, and pivot (pivot is a mod new buzz word of young startups today) your business model. They sell a guide and an Ipad App. Offers a Business Plan template of sorts very similar to the Business Model Gen Canvas. You need to buy the book..
Based on the Business Model Canvas by Alexander Osterwalder. It’s a paid beta lab right now. They plan on launching the product in January. This is pretty cool and quick. It takes you through 8 click of a button no brain steps from Idea – Revenue to Generate plan. Of course you have to provide your email and other info to get the PDF. I wouldn’t submit anything here(product, service or idea) that you consider to be awesome. Hey, until you have your Ip (intellectual property tightened up) you should be somewhat cautious of submitting to open sites. An online scratch pad using the same template originated by Alexander Osterwalder. You need to register to keep your model. With any of these, as with all tools, which there are many, you want to work with them a bit first. Most of these tool providers have some sort business model surrounding this free tool offering. One thing for sure is that these are all designed to be pretty easy to use (its not Photoshop) otherwise it would kind of defeat the purpose. But as with any tool you should do a quick review to evaluate the learning curve and the end value compared with the cost of your time spent. Many of these innovative models come from an old schooled perspective and are kind of fancy and complicated versions of very simple tools…like pencils and paper. We use google docs a lot but still resort to the organic note book albeit not as much as we used to. Bottom Line. These are all fun yet it comes down to what is easiest and most useful for you to use on an ongoing basis. Since ideas, innovation, strategies and plans change daily in this new era you need to use something that is quick and nimble because of course you can’t afford to spend all your time planning. Check them out and if you have a moment drop us a short comment or tweet and tell us what you think. Cheers.